A previously unseen archive featuring the testimonies of Guernsey people who were deported to German prison camps during World War II has been uncovered. The file of about 200 pages had been in a wardrobe since the 1960s before being given to a Cambridge University team. They were in Guernsey researching the story of the 2,000 people deported from the Channel Islands in 1942-43. Dr Gilly Carr said it was "the single most important resistance archive ever to emerge from the Channel Islands". The record, put together by Guernseyman Frank Falla, contains first-hand accounts of islanders who were arrested for acts of resistance during the wartime occupation of the island and later deported to prison camps in Europe. Many of the statements, which Mr Falla compiled to make claims for compensation from the German government after the war, describe in graphic detail appalling experiences they endured. Dr Carr said: "In a word, the file is incredible, the contents have never been studied and we are the first people to see it since it was made. "When we found out what was in it, we knew we had hit an incredibly rich seam of new historical information. "Researching the resistance in the Channel Islands is still a very difficult and sensitive issue. Not everybody felt that they could afford to defy the Germans at the time and emotions still run deep. "As a result, the story of these people has never been analysed in a complete or definitive way. We are the first to try, so to have this archive at our disposal is quite amazing." In one of the files Cecil Duquemin described how he and 400 other prisoners were moved between prisons in cattle trucks after their original camp was bombed in 1945. He said: "We had no sanitation and though suffering from starvation and malnutrition, we were forced to bury the many prisoners who died in the trucks. "This was a daily occurrence and we hardly had any strength left in us to dig the men's graves." Mr Falla, who was deported for running an underground newsletter, gave his own testimony of the conditions in a Gestapo-administered prison at Frankfurt: "[Prisoners] were being executed by the Nazis by guillotine at the rate of 25 per week." Dr Carr said: "There were so many Germans in the islands that people could not organise armed resistance in the same manner as the French, but many of them tried to resist in other ways. "Falla was always angry that they went through so much, but that their efforts were never properly recognised." Mr Falla was part of the Guernsey Underground News Service (GUNS), which used wireless sets, often homemade due to a ban by the German authorities, to listen to the BBC and pass on the news to other islanders. Two of the five GUNS men, who did not all know each other until they were caught, died in the prisons they were sent to. In the 1960s Germany paid the British government a one-off sum so that people who had suffered from Nazi persecution in German prisons and concentration camps could be compensated. Mr Falla compiled the statements for people in Guernsey, but the forms he submitted to the UK Government have never been released. 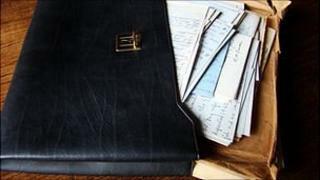 The original testimonies were stuffed into a briefcase and stored in the wardrobe in his daughter's house until the summer of 2010. Dr Carr said: "In some cases these people were bundled off in the night and nobody outside the family - and even some family members - knew what had happened. "Even when they came back, there was no formal welcome and they were never publicised as heroes. "While the story of a small number was published in local newspapers after the war, there was little subsequent interest and no formal recognition of their heroism. "Without this archive, the real story of their brave acts and the sufferings after capture of so many would not just have been forgotten - they would never really have been publicly known about at all." The testimony of Henrietta Gillingham, the wife of Joseph Gillingham, who died in captivity after he was arrested for his involvement in the GUNS, was among the papers. Mrs Gillingham wrote: "He was ill-treated, starved and denied all the rights one would expect even from an enemy. "I received not a single letter from him, nor did I know whether he was alive or dead, or where he was. "From the treatment given to other islanders who had done their time he was either put into a concentration camp, taken on a forced march against the Americans' quick advance into the town, or killed. "Not even to this day have I heard where he is buried or how he died." Although his story is known by his family they are hopeful the publicity will help their campaign for a memorial to those who lost their lives resisting the Occupation. All the time I was in prison I, along with the others, was subjected to the most appalling treatment, mainly by being starved and, at the slightest provocation, beaten. I was denied every human right such as Red Cross letters and parcels and medical attention. On our forced march across Germany many of those on it died through starvation, malnutrition or utter exhaustion, and if they fell by the wayside they were just left there to die. Allan Harris, husband of Joseph Gillingham's daughter Jean, said: "We're pleased this research is being undertaken, it's necessary that people know what they did. "Some years ago we unsuccessfully approached the States about a memorial, hopefully as a result of Cambridge University producing a definitive history of resistance those who lost their lives will at last get a proper memorial." Guernsey's Bailiff Sir Geoffrey Rowland said: "It's an immensely important archive, it's an archive that demonstrates their bravery and their courage and what it does is illuminate for us just exactly what it was about to be involved with the Guernsey Underground News Service, to be arrested, to be sentenced, to be imprisoned. "The government put up a memorial to people who died in the armed forces but they didn't go so far as to put up one marking resistance - their bravery, their courage has got to be marked. "We know bits of the jigsaw, but there's no way we know the complete picture. When we see the complete picture islanders are going to be very very proud of people like Frank Falla and I think people beyond our shores are going to be quite astonished." The Channel Islands were the only piece of British soil to be occupied during the war. During the German offensive the British government decided the Channel Islands were indefensible. They were demilitarized, but this was not communicated to the German authorities resulting in the bombing of St Peter Port Harbour, before the Occupation began on 30 June 1940. The islands remained under German rule for five years and during that time were turned into an "impregnable fortress" on the express orders of Adolf Hitler. A fifth of all the defence works in the so-called Atlantic Wall - a defensive line stretching from the Baltic to the Spanish Frontier - were built on the Channel Islands. While the German occupiers effectively ruled the islands, the civilian administration remained in the hands of a Controlling Committee, made up of senior politicians. The co-operation between the island's States, Police and other authorities has been called collaboration by some. However, 1,003 men, women and children were deported from Guernsey and Sark during 1942 and 1943, many for acts of resistance. In September 1942 the British started to intern Germans living in Persia (modern-day Iran) fearing a German monopoly of Persian oil and Hitler responded by personally ordering the deportation of Channel Islanders as retribution. English-born men and their dependents were targeted first, then men who had served as officers in World War I and later those who had been imprisoned for acts of resistance were deported, along with their families. The majority were taken to civilian internment camps in Germany and France with some never returning to their island home. Others started to be released after the Normandy landings in June 1944. However, those left in the island started to suffer from a lack of food as supply routes to the islands from St Malo were cut off in August. For eight months islanders and the German garrison were close to starvation before the island was liberated on 9 May 1945.